I knew that soup had its place in a meal. It could be a light starter to a dinner, a hearty and show-stopping main dish, or even a palette cleanser between courses of an elaborate meal. Until I received Room for Dessert in the mail, however, I was not aware that soup was ever eaten after dinner. Soup for dessert? Yes, it sounds strange to me too. Despite my misgivings, I knew I would eventually have to make it. I also am not one to shy away from an uncommon or unfamiliar dish. 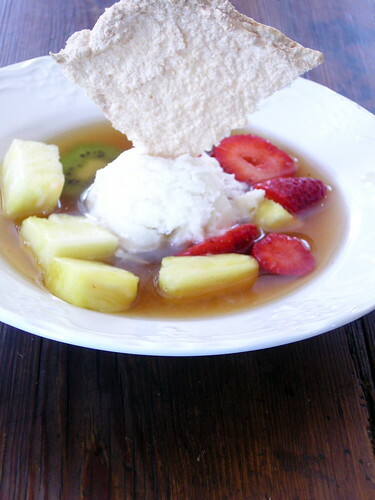 I knew that it was time to make the soup after I made the coconut sherbet that was to accompany it, otherwise I would have to make that dreadful frozen "treat" again. It was a good thing that I had my camera and tripod set up and ready to go because the sherbet started melting into the soup almost immediately. I was only able to photograph one of the bowls, as the other ones had become sort of milky looking from the sherbet. This really is not my kind of dessert, and I am sure that many of you are thinking the same thing. The soup base was ridiculously sweet, and I didn't really care for the combination of textures. Either way, it is another completed recipe, helping me on my to finishing the book (on that note, I have decided to forgo the chapter on custards and souffles and the chapter on liqueurs and preserves because of my time constraint). Bring water and sugar to a boil. Coarsely crush cinnamon, star anise, cloves, and black peppercorns in a mortar. Add spices to boiling syrup, turn off heat, and add vanilla beam, orange zest, lemon grass, and ginger. Cover pan and steep for 1 hour. Strain soup base and discard flavorings. Add rum and chill thoroughly. Preheat oven to 350. Line baking sheet with parchment. Whip egg white with salt slowly until it is frothy, then increase speed, whisking until it stands in firm but drooping peaks. Continue whipping whites as you sprinkle sugar over them. Whip until all of the sugar has been added and the meringue is stiff and shiny. Fold in coconut. Spread coconut meringue onto prepared baking sheet. Bake for 10 minutes, until deep golden brown. Cool completely. Toss fruit together in a bowl with a sprinkling of sugar. 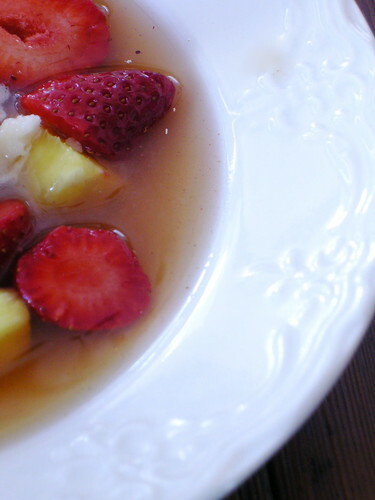 Divide fruit into four wide soup bowls and ladle chilled soup over them. Tear fresh min and scatter over soup. Place a scoop of coconut sherbet in center and stick a shard of coconut meringue into sherbet.